Although almost all of gold which can be found in Michigan’s Upper Midwest Peninsula is widely scattered glacier gold, there was one commercially profitable gold mine in the State of Michigan’s history. This was the famous (well, it was the only successful one) Ropes Gold Mine. 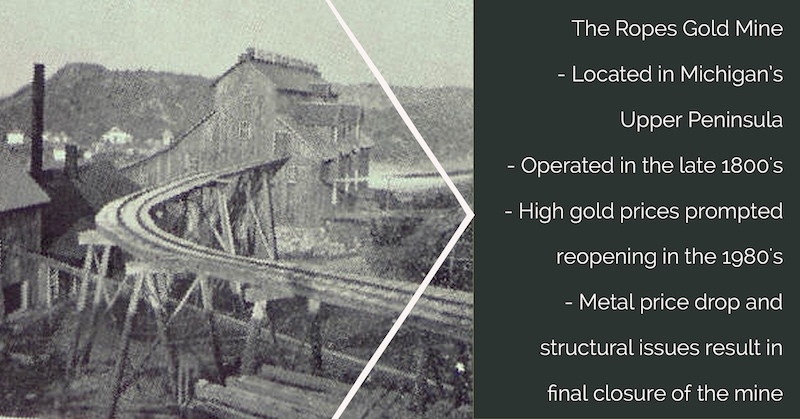 The Ropes gold mine has a fascinating history that dates back to 1881 when gold was discovered near the town of Ishpeming by Julius Ropes. He was someone who dabbled in a number of different trades. Ropes had been a postmaster, former druggist and school board member. Of course, he is only remembered for his time as a gold miner. After discovering the gold, Mr. Ropes quickly formed the Ropes Gold and Silver Company to explore and mine at his find. Mining at the sight began in 1883 and continued for only 14 years until 1897. At this time, financial difficulties forced the company to close down operations at the site. The Ropes Mine did not remain idle for long. In 1900 Corrigan McKinney and Co. bought the mine and recovered gold worth about $200,000 between 1900 and 1901 from the tailings left by earlier mining at the site. Additional gold was later recovered from the mercury amalgam which was still present in the mine from the old Ropes operations. Corrigan never did much successful exploring themselves, but was able to benefit from processing the debris left over by the Ropes Company. When these easy pickings had been removed, Corrigan just closed up shop and began looking for a new buyer. The mine then changed hands several times over the years with very little gold being recovered by anyone. Finally, Callahan Mining Co. bought it in the 1970s when gold prices had increased substantially due to inflation. A much higher gold price made the mine potentially profitable again. Callahan Mining Co. then invested in exploration and rehabilitation of the mine. Mining resumed in 1983 with the sinking of a shaft decline to 900 feet in depth. A new shaft plunged even deeper in 1984. This time the workings went down to a still greater 1548 feet in depth. Fortunately for the new mine owners, ore rock could be trucked to the ore dressing plant of the retired Humboldt Iron Mine for gold extraction. Were it not for this nearby processing location, operations would have been far more expensive, perhaps even prohibitively so. The mine collapsed in 1987 halting the mining temporarily but the hole was quickly filled with sand and the mining resumed until 1991 when gold prices dropped too low to justify continued expensive repairs and pay for costly new safety improvements. Erosion later occurred around the main shaft which forced refilling of the Ropes Gold Mine during the summer of 2001. It still sits there lonely today, having been fenced off for safety precautions. Some of Michigan’s finest gold specimens originated from the Ropes Mine. Despite this temptation, no mining is actively taking place at the Ropes Gold Mine today. There may still some good gold ore down there, but it will likely remain undiscovered. There is probably just not enough gold remaining to justify the high cost of operating at this very difficult location. The Ropes Gold Mine does have the distinction of being Michigan’s only truly commercially successful gold mine.